I often drive up to London on Christmas Eve evening to see the lights. The roads are relatively quiet and so it’s easy to park and wander. A few years ago I began taking my partner’s granddaughter, Holly, with us. The first year, as we drove up and down Oxford and Regent Street, she looked up in awe at the wonder of the lights. Eventually I parked and we walked to Leicester Square and the fair that is always there at this time. I was ahead and looked back to see a B-O-R-E-D little girl walking along seemingly endless and very dull back streets. As we rounded that last corner into Leicester Square she saw the traditional Fairground, complete with 100 year old roundabout. The wide eyed wonder on that kid’s face as she dashed from one stall to another was, for me, a ‘Magic Moment’. 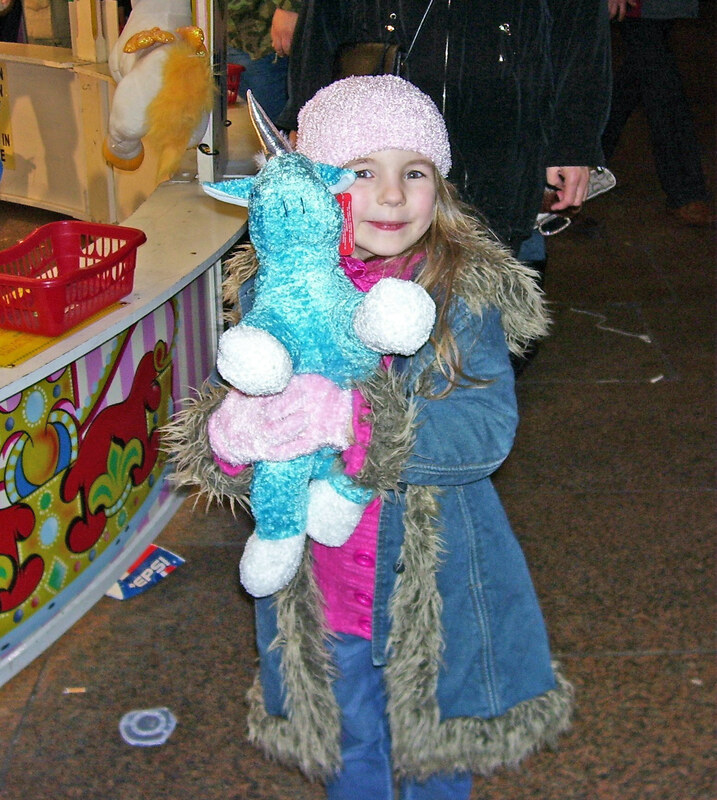 The following year we again took her up and this time, as well as the roundabout, she went on a stall where you had to get balls in buckets to win a prize. Because of her age she was allowed to stand on the ledge that went around the stall. She took careful aim with each ball but needless to say, they all bounced out. The sadness in her face was gut wrenching as I went to pick her up, adding a quick reassurance that we would return and try again later. Just at that moment a voice boomed out “The little lady has another 3 goes” and the stallholder came over with the extra balls. Her little face lit up and she tried again but with equal results and again the sadness and near tears was a double whammy for me! As I went to put her on the ground the voice boomed out again “The lady wins a prize” and the stallholder came over to her. “But I didn’t get any balls in” she timidly replied. “It’s Christmas darling. You don’t have to get a ball in to win a prize” he smiled. With that he bent down and produced a soft toy for her. I picked her down off the ledge and the photo above is the image I captured within seconds of her standing with her prize. There is not a single person on this beautiful Planet that will EVER convince me there is no such thing as ‘magic’ and how it visits us, if we allow it. At this special time of year I try to cut out the growing commercialisation of the season and focus on the potential for magic . . . because it’s always there! I have just recounted my ‘British’, ‘White’, ‘Spiritual’, ‘Male’ perspective of an event I will never forget – a piece of ‘magic’. What we can so easily forget is that events like this are playing out all of the time around the world, irrespective of race, colour, creed or gender. This is my first year on Twitter and it has been an intense and exciting learning curve, with many mistakes (of course) and a sense of real satisfaction at what I personally have achieved. I have experienced the warmth of people, as well as the sometimes intense anger. Above all however, I have entered an environment where people do not tolerate unpleasantness, something the outside world desperately needs, as well as making many new friends whose kindness and support have added another dimension to my life. To ALL my new Friends, Followers and RT’s I hope the magic that I believe in finds you over the next week or two, in whatever shape it arrives and continues throughout your lives. We are all in this Life together, no matter what we are urged to believe, and our own magic is out there just waiting for each and every one of us, if we allow it! My sincerest Best Wishes and Thanks to everyone for this incredible year. Let’s see what we can change in 2015! This entry was posted in Global Magna Carta and tagged Christmas, Friendship, Magic on December 22, 2014 by John Coombes. War + Christmas = Football! 100 years ago the first Christmas of the First World War offered a huge window on how united we are as a species and the effort necessary to keep us apart. 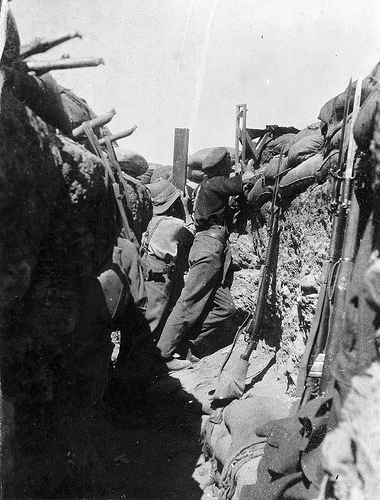 The trenches in that battlefield were close enough together that the soldiers on both sides could talk to each other. A respect developed that allowed each side to collect their dead and wounded without threat. Such was the rapport that on Christmas Day the war was ‘unofficially’ put aside, as men climbed out of their trenches and came together to talk and exchange gifts with the ‘enemy’, as well as playing football with them along a number of stretches of the battlefield. The ‘official’ reaction was horror, encapsulated by a young Charles de Gaulle who spoke with disgust about this “fraternisation and the lamentable desire of French infantrymen to leave the enemy in peace”. Another wrote of the “unfortunate consequences when men become familiar with their neighbours opposite“. Adolf Hitler, a young corporal then, spoke with disgust on the subject . . . An omen for the future! Brutal reprisals were made on officers and men to subdue any future fraternisation. For me this defines the historic mind-set of ‘Divide & Conquer’ and a perfect example of how the 1% have manipulated and turned the 99% against each other for millennia to protect their hold on power. What is it that drives this insane commitment to certain death by so many, with countless stories of the youth lying about their age so they could join up and (unknowingly) feed the slaughter? The answer, of course, is in the word unknowingly! The propaganda machine has always been brutally efficient, showing then such images as enemy soldiers laughing as they spitted babies on their bayonets and the equally manipulative call to arms with, Your Country Needs You. How could any young impressionable individual ignore these carefully prepared and placed messages, nor the taunts from others with minds already manipulated? And so they found themselves in water logged trenches, where disease and death go hand in glove, whilst recoiling from daily artillery bombardments that traumatised many for the remainder of their lives, if they actually survived! I would argue that the true nature of people cannot be suppressed indefinitely, as this Christmas time 100 years ago demonstrated, with friend & foe burying their differences. This lack of aggressive agenda is a defining quality of the 99%, when left to their own devices and despised and feared by the 1%. They know that if they let up for a second with their constant manipulation and propaganda the people will rise up and overthrow them, to live a more peaceable life in a more peaceful world. As long as that power and those who wield it, is enshrouded in veils of mystery the charade continues. However, we are moving inexorably into a new era, where the internet is tearing down those veils. Julian Assange and Edward Snowden, through their individual courage and integrity, have shown how manipulation and propaganda operates today. The lines are being as vividly drawn now, by the 1% towards the 99%, as they were with the trenches in that odious war. But once again we are seeing people climbing out of their trenches, uniting and supporting each other in peaceful protest across the globe. And again it is being met by increasingly violent police action and surveillance that attempts to continue the suppression. Like the First World War, this conflict won’t be over quickly, as the internet is an indomitable force for change. The 99% are discovering that threatening differences they have been constantly fed about each other are no more than the characteristics we all share, simply with a different language and colour of skin. We are learning that we all laugh and cry at much the same things, we want our children to be healthy and successful and we want to enjoy our lives as freely and fully as possible. We are recognising the abuse that is stopping this from happening and that it is something worth fighting about. The game of Football has now begun . . . and will continue, unabated, for many Christmas’s! Thinking from his book: Global Magna Carta. Returning Power to The 99% . . . If They Want It! This entry was posted in Equality of all Spiritual and Religious Beliefs, Global Magna Carta, Towards a Global Village, Transparent Democracy and tagged 1%, 99%, Democracy, Empowerment, Football, Manipulation, Propaganda, Surveillance, Trenches, War, World War 1 on December 17, 2014 by John Coombes.